1.3 Are there cheats or hacks for Rise of Civilizations? Some of our readers have requested us to create a post about Rise of Civilization Cheats. They were wondering whether it is possible to hack in Rise of Civilizations and if it would be possible to obtain free gems that way. Since we enjoy Rise of Civilizations a lot as well we decided to start looking into it. We’re happy that we’re receiving so many requests from our community. In this post we will do cover whether there are cheats for Rise of Civilizations. Furthermore, if they exist we will test them out to see if they work and if they are safe to use. If they don’t exist we will do more research and attempt to figure out a way to obtain free gems and food. But first, let’s talk a little bit about Rise of Civilizations and see what the game is all about. Rise of Civilizations is an online RPG city building game developed and published by Lilith Games. The game features real time battles, 8 unique civilizations, an alliance system, 20 different heroes, a PvP system and much more. The UI of the game reminds us a lot of Clash of Clans. The game has received a rating of 4.6 stars on iPhone. It received the same 4.6 star rating on Android. If we had to rate Rise of Civilizations we would give it 4.5 stars out of ten. The game is a ton of fun to play, especially if you’re a fan of the city building genre. In Rise of Civilizations is in essence quite similar to other games of the same genre. People who are familiar with these type of games should find it easy to get into. If you’re unfamiliar with this type of game then keep reading and we’ll tell you a little bit more about it. Rise of Civilizations features quite a few complicated mechanics that might be hard to master for players that are new to city building games. 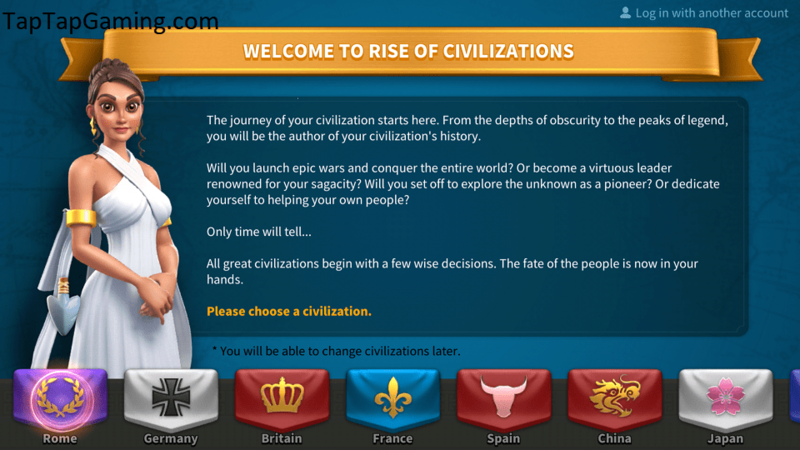 The main objective in Rise of Civilizations is to pick your civilization and to lead it to greatness. In order to do so you start out with a small town which you have to upgrade to a magnificent city. Just like in other multiplayer city building games your town can be attacked at any time. When you are attacked your resources can be stolen. It’s therefore very important to defend the city. You can defend the city by recruiting troops and commanders. You can also upgrade the structures in your town to act as an additional layer of defense. Since other people can attack your town it only makes sense that you can do the same. Attacking other people’s town can be very profitable because of you beat them you can loot their stockpiled resources. You can then use these resources to make your town even stronger. Are there cheats or hacks for Rise of Civilizations? Now onto the question that we were wondering about when we started this post. As we’ve said, we received some questions from our readers whether it is possible to obtain free gems in Rise of Civilizations by hacking or cheating. We started our search and we found a lot of websites that claimed they had a working hack for Rise of Civilizations. However, when we tried their Rise of Civilizations Cheats we never received the gems that we were promised. We must have tried at least a dozen of these so called generators for unlimited gems but we were disappointed every time. If you’ve been looking for Rise of Civilizations Cheats then you might have run into the same websites. If you have tried them then you know just as well as we do that they’re fake. They might look legit but don’t fall for them. You can’t hack or cheat in Rise of Civilizations. However, it is possible to obtain free gems in Rise of Civilizations! After we realized that there were no working cheats for Rise of Civilizations available anywhere we didn’t give up hope. We knew that there had to be some way to obtain free gems. We knew this because we have played a ton of these games and it’s always possible. 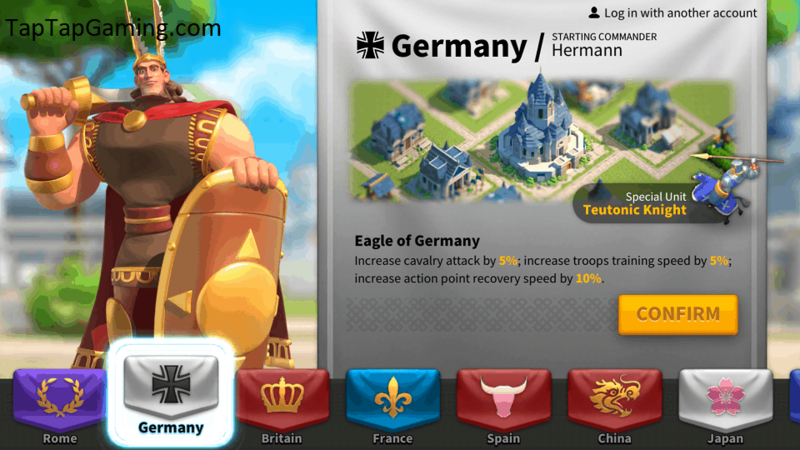 For example, we found a way to obtain free resources in Be the King, Clash of Kings and tons more. So we kept on searching until we eventually stumbled upon a method that taught us how to obtain free gems in Rise of Civilizations legitimately. This method is not easy to find! It takes hours of searching and testing method before you finally find a working method. For that reason we decided to write a guide for our readers to teach them about what we found. In this guide we will show you step-by-step how you can obtain free gems. When you follow the method in our guide you don’t break any of the game rules so you don’t have to worry about your account getting banned or anything like that. This is the method that the top players use so it’s completely safe to use. Best of all, the guide we created is available for free and works on both Android and iPhone. 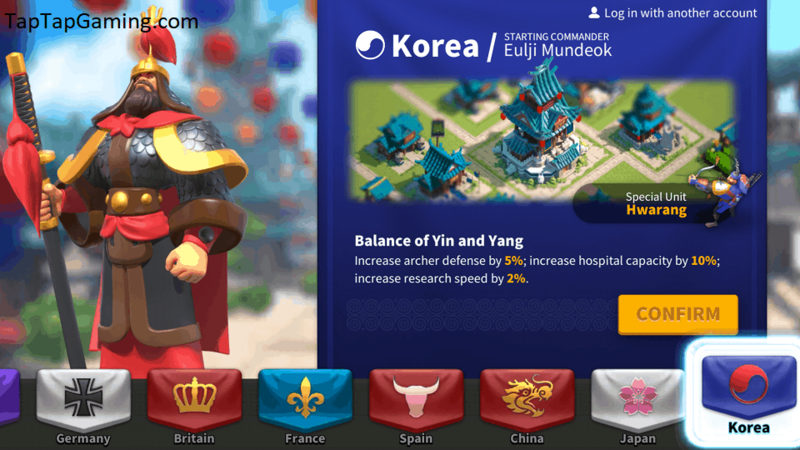 Stop falling for fake cheats and hacks for Rise of Civilizations and use the only working method that we show you in our guide! Simply click the big blue button below to learn how to obtain unlimited gems. There are 8 civilizations in Rise of Civilizations. You can choose which one you want to play as when you first start the game. You can change your civilization later if you feel like you have made the wrong choice. Each of the 8 civilizations have their own unique bonuses. We will cover each of these civilizations so that you can make an informed choice about which civilization you would like to play as. The Roman Empire is a speedy infantry based civilization. As you can see, their infantry has 5% increased defense. They also have a 5% troop march speed increase. Lastly their food gathering speed is increased by 10%. 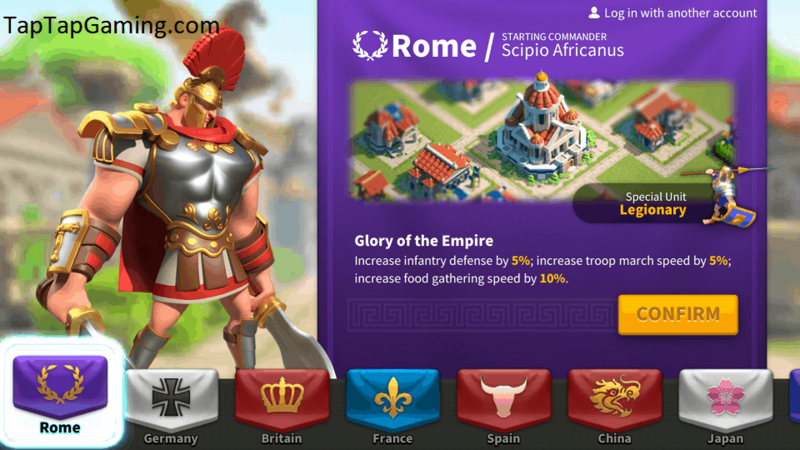 The starting commander for the Romans in Rise of Civilizations is Scipio Africanus. They also have a unique unit called the legion, a strong infantry unit. If you’re planning on making a lot of infantry units, then Rome could be a good choice for you. However, their starting commander, Scipio Africanus, is not the best. The German Empire is a cavalry based civilization. Their unique unit, the Teutonic knight is a cavalry unit too. Their cavalry has 5% bonus attack and their troops train 5% faster. In addition, their action point recovery speed is increased by 10%. Their starting commander is Hermann. If you’re planning to build an army that’s heavily focused on cavalry then Germany is the top pick for you. Their Teutonic knight is very strong. Germany is by many considered to be one of the top civilizations. The fact that they have strong cavalry combined with the fact that their action point recovery is increased means that you’re very strong in offense. This gives you a pretty substantial advantage. The Britains are an archer civilization. Their archers have 5% bonus attack. Furthermore, their wood gathering is increased by 10%. They also have a 20% increased ally garrison capacity. The starting commander for the Britain Empire is Boudica and their special unit is the Longbowman. If your playstyle is geared towards making archer heavy armies then Britain is a good choice. 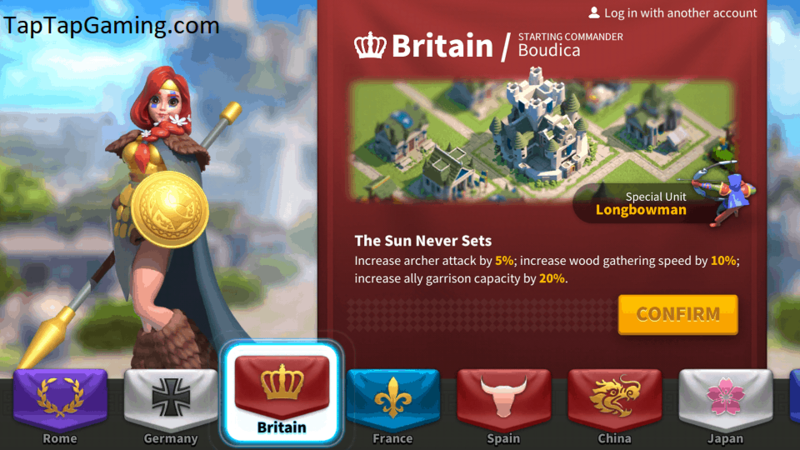 However, it has to be said that Britain is a little underwhelming compared to the other civilizations in the game. It’s considered one of the weaker civilizations in the game due to the fact that their commander is not that strong. The fourth civilization that you can choose from is France. 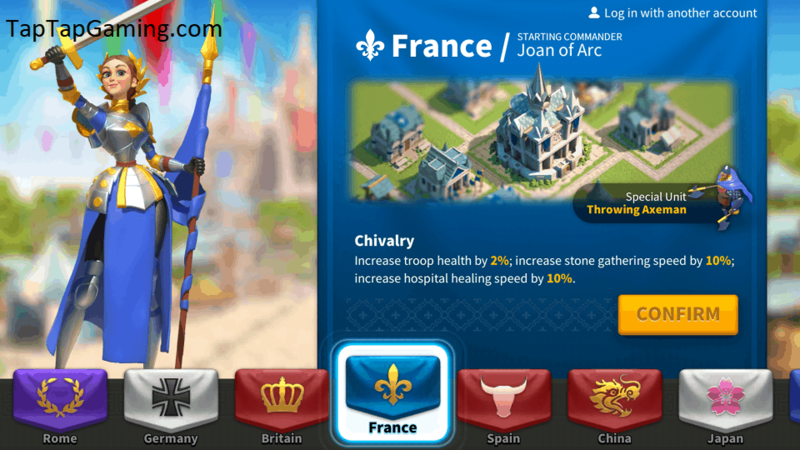 The starting commander for France is Joan of Arc and their unique unit is the Throwing Axeman. France is mainly focused on resource collection. France is considered by many to not be a top tier nation in the game. It excels at resource gathering but is lackluster in most other aspects. Their troop health is increased by 2%. They also have 10% increased stone gathering speed and their hospital heals units 10% faster. Spain is another cavalry civilization, similar to Germany. 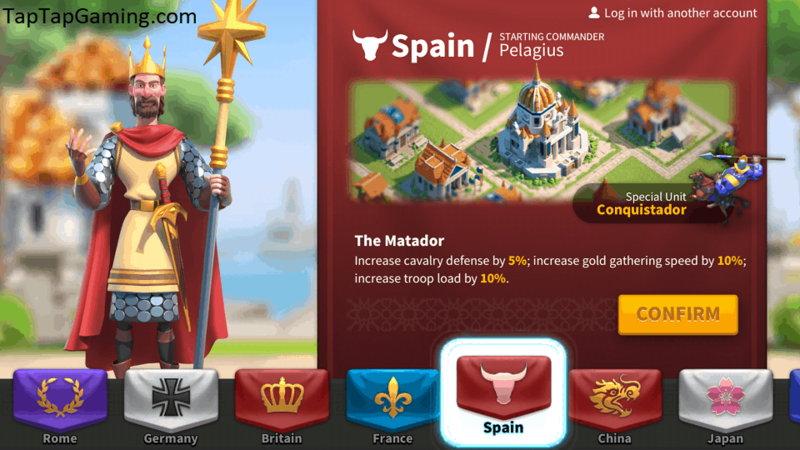 The Spanish have 5% increased cavalry defense and their gold gathering speed is increased by 10%. They also have 10% increased troop load. The Spanish starting commander is Pelagius and their unique unit is the conquistador. The conquistador is a strong cavalry unit which makes Spain a pretty strong pick. Furthermore, since gold is not all that easy to come by the 10% increased gold gathering speed is quite useful. China is the first non-European civilization that the player can choose from. Their starting commander is Sun Tzu and their unique unit is the Chu-Ko-Nu. The Chu-ko-nu is an archer unit. 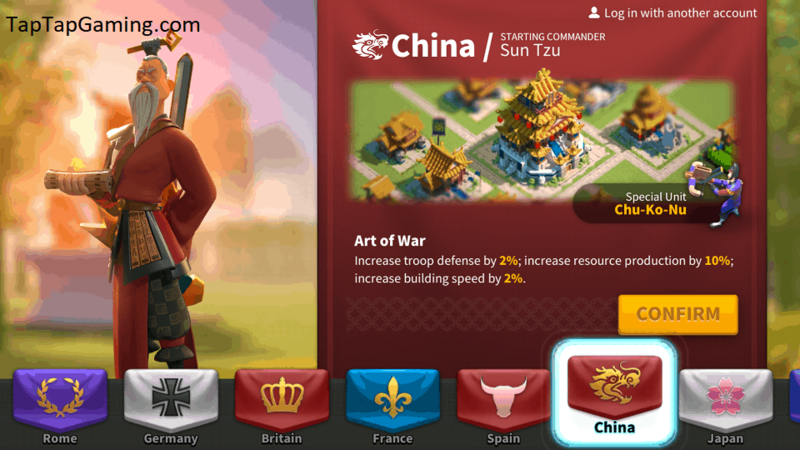 The Chinese unique ability increased troop defense by 2% and resource production by 10%. Their building speed is also increased by 2%. These bonuses are quite nice and China is a strong pick. Japan is a pretty strong civilization. Their unique commander Kusunoki Masahige is one of the stronger commanders in the game and their special unit the Samurai is also strong. 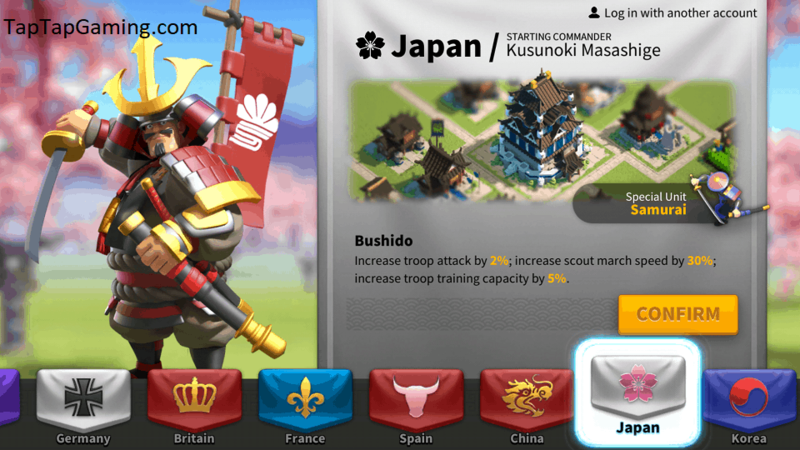 The unique bonus Bushido increases troop attack by 2% and scout march speed by 30%. You will also have a 5% increased troop training capacity. Overall Japan is a pretty solid pick. Korea is the last option that you can choose from. As a civilization Korea is quite underwhelming. The reason why is because, similarly to Britain one of their unique bonuses is related to their hospitals and is not very impactful. Their unique commander is Eulji Mundeok and their unique unit is the Hwarang. Their unique unit is not all that strong but their commander is alright. The unique civilization bonus increases archer defense by 5% and hospital capacity by 10%. You will also research 2% faster. In Rise of Civilizations the commanders are the leader of the army that command your troop in battle. Each commander has their own unique buffs for the troops that accompany them. You can access the commander’s menu by tapping on the button in the bottom left. From there you can navigate to the commander’s menu and see which commanders you have available to you. You can then check out their stats and skills. You start the game out with a starting commander which is different for each civilization. We’ve already covered all the starting commanders for each civilization. But you can also unlock more commanders. In order to unlock more commanders you have to open chests. You do this by going to the tavern and opening either a silver or a gold chest. You can open a few of these for free.